Never let your video camera get dew which is dust and debrss fro cheap cassets iner dew so be careful keep it clean. Noe batteries you need top of the line with a seperate charger making it a non problematic future. "Dew" means there is condensation (moisture) in the camera. The camera may refuse to operate until it is thoroughly dried out. Sounds like condensation. This can cause the tape to stick and snarl, so the camera probably won't lace up until it drys out. If you leave it in a warm dry place for a few days it should clear up. Obviously excessive humidity inside the camcorder. Follow whatever described in the manual.Or if you had already lost it,just let your camcorder in dry place for a couple of days.This should fix your problem. Sharp Mini DV. VL-Z5H ViewcamZ. hardly used but dew warning comes on continually and it turns itself off or alternatively it just won't accept a tape. Can this be fixed? It can be easily fixed by sharp authorized service center. http://ataplow.googlepages.com/sharp-dew-problem just click this link read the instructions carefully and follow them properly to resolve this problem. thanks. 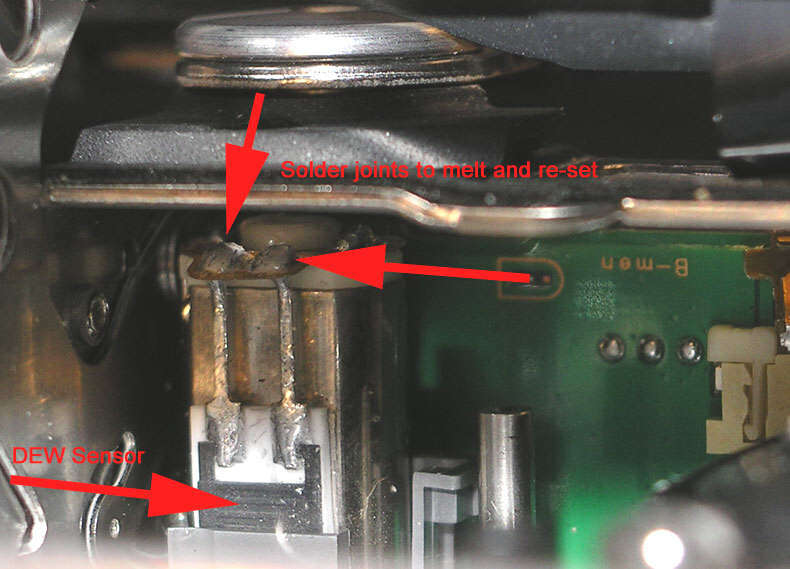 The solder joints to the DEW Sensor were "cold joints" which means that the solder joint is defective - is not a sound joint. This means that with temperature variation, the solder joint can intermittently separate and break the circuit, causing the DEW Indicator to come on and completely shut down the camera. get a real slim soldering iron with a fine point. Open the tape cover and take the tape out. Get a strong light to shine down into the mechanism.